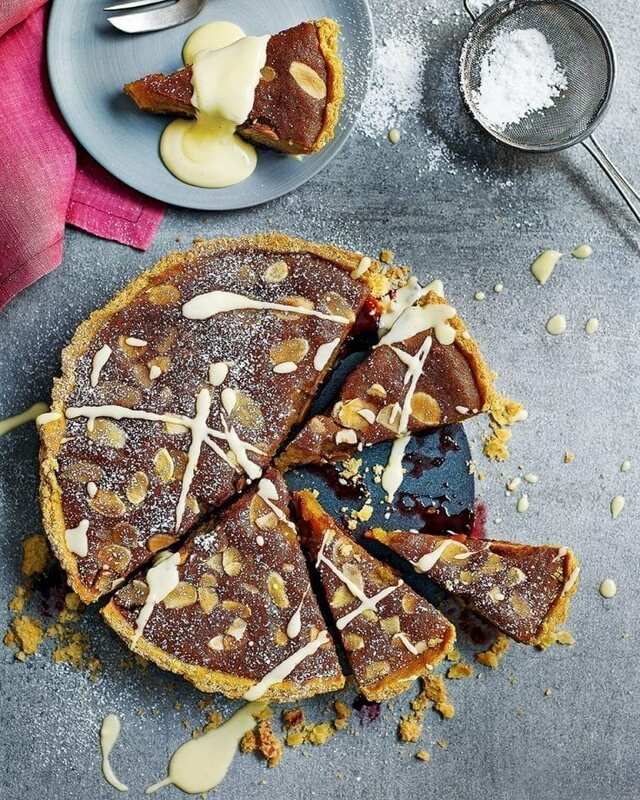 The combination of blackberry and lime brings a modern twist to this old fashioned bakewell tart pudding. Add the egg yolk and water and pulse to combine (or bring the pastry together quickly with a table knife). Gather the pastry together, shape into a fat disc and wrap in cling film. Chill for at least 30 minutes. Take the pastry out of the fridge and roll out on a lightly floured surface to the thickness of a £1 coin. As you roll, use a palette knife to lift and move the pastry every so often to prevent it sticking. Roll the pastry loosely around a floured rolling pin and lift over the deep 20cm fluted tart tin. Press into the tin, making sure it goes into the edges. Using a sharp knife, trim away the excess pastry, making a neat edge. Cover the pastry with foil; fill with baking beans or uncooked rice. Chill for 30 minutes. Heat the oven to 200°C/180°C fan/gas 6. Transfer the chilled pastry case to the middle oven shelf and bake for 18 minutes. Remove the baking beans/rice and foil, then bake for 3-4 minutes more until the base has no grey patches. Remove from the oven and cool. Turn the oven to 180°C/160°C fan/gas 4. While the pastry is cooking, prepare the filling. Whisk the eggs and yolk, sugar and vanilla with an electric mixer until pale and thick. Add the melted butter and ground almonds, whisk again, then set aside. Mix the blackberry jam and lime zest in a small bowl, then spread over the base of the tart. Top with the defrosted blackberries, then pour over the filling. Sprinkle with flaked almonds, then bake for 35-40 minutes until the filling is just set and golden. Cool for 15 minutes, then remove from the tin. Dust with icing sugar and serve with custard. For a more traditional bakewell tart, replace the blackberry ingredients (jam and berries) with raspberry ones. The lime zest helps to offset the sweetness, but you can leave it out if you prefer. Prepare the pastry to the end of step 3 up to 24 hours ahead. Or bake as in step 6 up to 24 hours ahead, then cool and cover. You can also bake the whole tart up to 2 days ahead, then cool and chill in the tin you baked it in, wrapped in cling film. Eat at room temperature, or warm it in a hot oven for 10-15 minutes.